One hot day in May of 1930, the Sandy Spring Volunteer Fire Department was called out to a field fire below Colesville. They were out so long that at lunchtime two ladies, Mary Reading (Nichols) and Helen Becraft from the Insurance Office drove down to see what was going on. They found the men hot and thirsty. Delmas Wood, Sr asked them to go back to the Sandy Spring Store and get some cold drinks. They did and the idea of the Ladies Auxiliary was born! On the way, Mary Reading and Helen Becraft discussed the need of support for the men – all volunteer then and all giving so much of themselves. Mary Reading invited Betty Wood, Francis Davis, Helen Farquhar, Lenore Kemp, Helen Becraft and Miss Sallie Brooke to her home to discuss forming a Ladies Auxiliary. The first in the County! The idea caught on very well in the community of Sandy Spring. In 1994, the Ladies Auxiliary became The Auxiliary to the Sandy Spring Fire Department – an official institution to the fire department. Currently, we have 40 members. 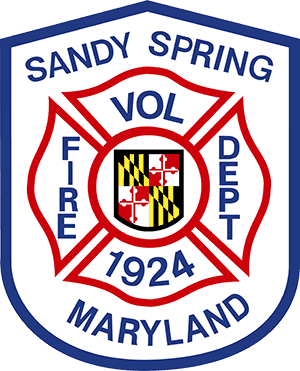 The purpose of the Auxiliary from its inception has been to aid and support the Sandy Spring Volunteer Fire Department. The ways and means are somewhat different today than what they were in the 1930’s, but the spirit has not changed. The Auxiliary has supported the fire department, as well as the community at large. The Auxiliary’s function is to support the men and women of the Sandy Spring Volunteer Fire Department include getting the canteen out to a fire; making a sizable contribution toward a purchase of fire equipment or helping with the Fire Department’s annual Open House. The Auxiliary has also supported other community efforts such as the Olney Day Parades, National Night Out, and 9-11 Vigil. Anyone interested in joining the Auxiliary or would like more information, please contact us. (1) Source: Excerpt from “Forming the Ladies Auxiliary, Sandy Spring Volunteer Fire Department”, October 27, 1984 Banquet Program. If your child, ages 4-6, loves fire trucks, firefighters, fire hydrants…anything fire related, why not have their birthday party at the Sandy Spring Volunteer Fire Department? The party includes a tour of the fire station, a safety talk with a firefighter, a chance to sit on a fire truck and use of the fire station meeting room for cake and ice cream.